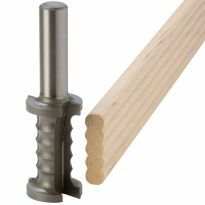 Easily create rock-solid mortise and tenon joints. 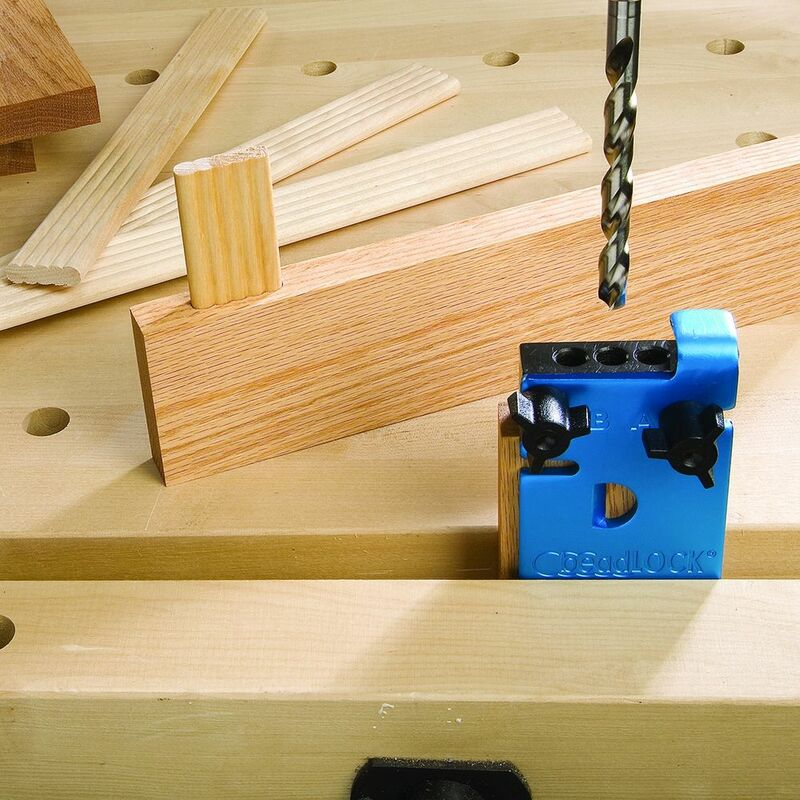 Create rock-solid mortise and tenon joints with just your hand drill and this Beadlock® Kit. Ribbed tenon design prevents racking and increases the amount of precious face-grain glue surface. The result is an extremely strong, totally concealed joint. 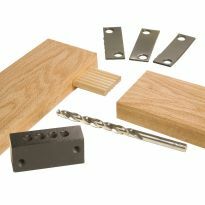 Included shim set allows you to mortise a variety of stock thicknesses, as well as to offset your mortises. For narrow material, rip the tenon stock down to fewer "beads"
Just like everyone else who bought this jig have found out, the blocks didn’t line up after joining them with the Beadlock tenon. In my case, I found a discrepancy of about 1/32” between the two lines drawn on the blocks. 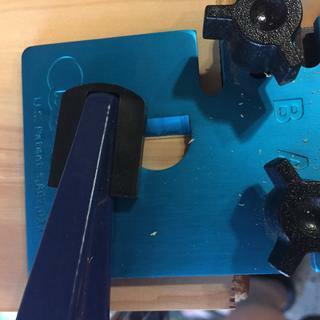 The reference edge on the blue plate apparently does not line up with the center of the black drill block. The misalignment is about 1/64”. For a $30 jig, actually that is damn good. The solution of course is putting the reference line on the drill block itself. I adopted the method of putting a scribed center line on the back of the drill block; a method suggested by a previous commenter. To do this, I used a Kreg Multi-Mark to find the center line by trial and error, using masking tape to cover the block surface before the final line was determined. Using the new reference line, the blocks line up perfectly every time. 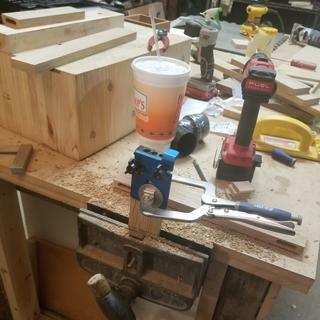 I am working primarily with 2x4’s so I have to use shim to move the mortises closer to the center. If the thickness is not even across the surface of the shim, the mortises will not line up parallel with the edge. The error will be doubled when you join the 2 pieces. It will appear as a twist between the two blocks, and is very noticeable when you have a long edge. The solution is to control the evenness of the shim. I end up using some plexiglass to make my shim. Using the new shim, the twist is minimized. A good strong alternative to classic tenons on a large production run. I bought this as I had 18 chair frames to make for an upholstery workshop. 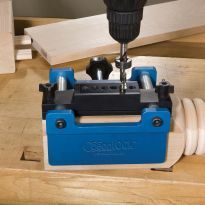 System is simple to set up and use and flexible enough to use standard width tenon inserts or cut them down for smaller pieces. The system cut production time down significantly and actually saved wood. 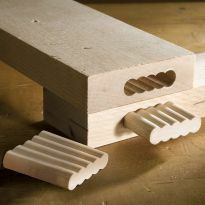 The joints are equally as strong as standard tenons and if you use the optional cutter the fit can be adjusted as well. Been using Dowels for a while and wanted to try another system. Was debating on getting the Pro system but wanted to test out the smaller one 1st. Tested it out on a small project 1st(Picture Frame) and I have to say I really like it so far. Having the Kreg clamp is really helpful for speeding things up. One suggestion I would tell anyone if they want to get one it to use a red pencil. Its so much easier to see the lines when you are marking your pieces. I also think on some projects it may be easier to reference off of the sides of the pieces instead of using the lines. I will be looking to get the Pro System here shortly and would recommend it to anyone. I purchased the Beadlock system as a quick and easy alternative to the Festool Domino to do mortising for table joining. I gotta say, I'm pretty impressed. The only drawback (and it really applies only to the type of woodwork joining that I do) is if you want to do slightly looser or floating tenons you kinda have to play with the drill after you use the jig to make the mortises. But other than that, it's accurate, simple to use and I don't have to spend over $1,000+ for a domino system. I have heard about and watched mortising and have been hesitant to do one in a project, but I purchased this Beadlock© starter and put it safely under the cabinet in the shop. I needed to fix the wood on the side of my mother's garage door, but I didn't have a scrap piece of lumber in the correct withe. So I pulled out the instructions and started to read. I just couldn't make sense of the instructions to I went to the fallback and found a video on "YouTube". In 5 minutes I realized it was so much easier than I thought. I went out into the shop and put in 4 Beadlock "tendons" within just a few minutes and they fit perfectly the first time. I'm very pleased with this setup. Other than clamping it down with one hand, this makes joinery super simple and almost impossible to miss your marks. Other than the loose tenon joinery, the beadlock tool also works great for a panel glue up if you don’t have a biscuit joiner. It's great. 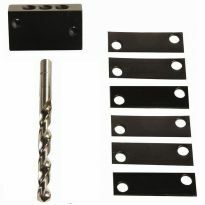 I plan to use it a lot and therfore I bought the router bit so I will make my own headlock biscuts and save a lot of money. Easy to use. Very effective. A big time/effort saver! I used the Beadlock system to build a face frame for a cabinet. It was very easy to use and worked great. I am also going to use it to build the door for the same cabinet. 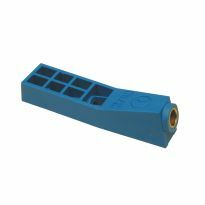 Very precise tool, excellent quality. This is a great tool the first time I've used it it was easy and worked great. 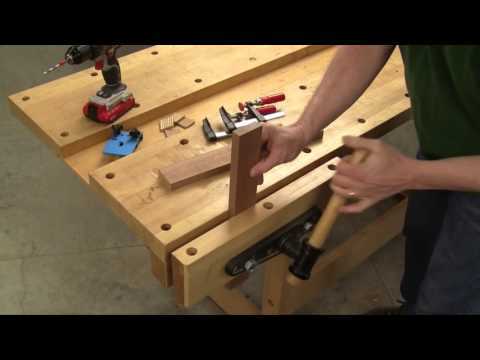 A very simple method to make floating tenon joints. Assembling the jig caused a few minutes of headscratching before the aha moment occurred. After that I could appreciate the economy of means that went into the design. Some illustrations show everything being held in a parallel clamp. This seems a bit iffy, but any sort of bench vice should produce a stable setup and consistent results. The tenon stock is of good quality. I absolutely love this tool. It has been great. I don't own a thickness planner or biscuit joiner yet. So I picked this up to help with panel glue ups, and it has worked superbly. Three of these down the length of my panel and the smallest amount of sanding and I have a perfect joint. The learning curve was almost nonexistent it felt so natural to use. The design was perfect and efficient. I would be out of my mind if an add on was available that being a face drilling jig. As in maybe a large square with a mount for the drill guide block that would allow me to use this for shelves. Instead of rabbit and dado joints. I bought this to build a Walnut coffee table and a sofa table. About 16 joints in total. All came out perfectly using the 3/8 jig. Alignment was NOT a problem because I used an incra gauge to set up perfect registration. I used two ratchet clamps to hold the jig securely in place and facilitate quick release. 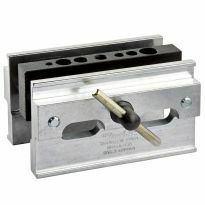 Actually, this simple starter unit may be better than the pro in terms of secure clamping versus the small plastic knobs. Just bought the 1/4&quot; add-on jig and quickly built two craftsman style 16x20 picture frames from quarter sawn oak. Another perfect alignment and secure joint without all of the hassle of mortise and tenon joints. Great product! I bought this to make 4 chairs and absolutely love it. I promptly cut off the tab so I could use a depth collar. I used 30 joints per chair. So 120 joints later-240 mortises,1,920 drilled holes, everything is dandy with no issues or mistakes. I plan on getting the pro model sometime as I can see using both jigs for unlimited joinery. The joints are rock solid and easy to align after practicing on scrap. I'm just mad I didn't think of this simple jig first. I purchased the jig along with the 1/4 block which I used almost exclusively for my first project. I had no problems with the 1/4 lining up or drilling correctly. Two high chairs with no screws in them whatsoever later, it worked excellent. The only down side is that I put drill stop collars on my bit to get fast, consistent holes. The stop curved top piece of the jig does not have clearance for drill stops for the last holes. I removed a portion of the block to accommodate this. It takes a little more attention especially since I ripped all the stock to five beads instead of seven for this project. Very pleased. 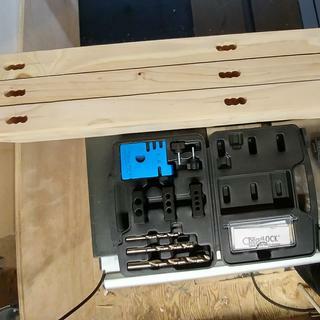 Purchased Beadlock and put it work immediately, worked like it was advertized then I purchased additional kits for it to round out my options to varying wood project. Thank you very good tool. Easy to use and set up. The jig can easily handle much thicker shims to handle thicker stock. I got some extra knobbed bolts the same size but 3 inches long and can now place the jig in anywhere in anything up to 3&quot; thick. The only issue I had was that the 1/2&quot; bit with the assessory kit needs a 1/2&quot; drill. Oh well, now I guess I get a bigger drill for Christmas. Worked exactly as advertised the first time out of the box. I am planning on using it in an upcoming project that will have about 16 joints to use it on. A real time saver over mortise joints. This is a very simple and effective tool. I received mine today and went right out to the shop to try it out. It worked great right out of the box, making a nice, tight mortise & tenon with 3/8&quot; bead stock. The only thing I added was a flat washer under each of the tightening knobs. This will be a great time-saver. Constructing a 66&quot; X 84&quot; Welsh Dresser which has 46 tenons. This tool made it simple, fast and accurate to complete...in about one eight of the time to hand cut mortises and tenons. Very happy to have found it in your online catalog right before I began construction. The first try was off a little . Worked great after that. I assembled a maple vanity using all Beadlock joinery. I used 3/8" for the cabinet frame and 1/4" for the mirror frames. All the joints were square and glued up nicely. I made some test cuts on some pine boards and the mortises Were pretty rough. However, when I drilled mortises in the maple, they were very clean.I assume, since maple is much harder, the cuts are more precise. Also, centering the jig is all by eye. It can be clumsy to keep the jig centered while clamping it to your work while keeping an eye on your mark. I had some minor alignment issues which were easy to fix. Overall, I am happy with the jig. It's easy to figure out. The instructions are just shy of useless. The case is nice and well built. I'll be using Beadlock as an alternative to dowels and hand-cut mortises in the future. It's much cheaper, but just as effective as other higher priced methods. It is very easy to use. I have just did trial pieces. Have not made a bench yet. Thank you to those before me as I thought I was crazy on the alignment issues. I was 1/16 on my first two trial runs. then I started to mess around. I thought my stock was off. Finally I was able to get it to line up on the dot. They definitely are 1/32 inch off their machining process. Don't listen to the reps. Thought I share my technique as some of the other advice didn't fit my application. I had 90 bf of mont cypress, so this was all done on scrap. so I figured 1/16 off, meant it was 1/32 out of alignment, meant I had to adjust both pieces by 1/32. I found that is if you stay right of the line about 1/32 on each piece, it will line up dead center. If this is a machining issue, then this means that my findings might not work for you. I just went through 10 joints in 30 minutes or so. All of 10 are spot on center. I found a solution so I didn't give this product 1/2 starts. But just like any jig I buy or build, you gotta figure out the discrepancy. I still gave this product a 4 rating. 5 without company error. This jig is slick, quick and will make this outdoor patio set perfect with no metal in it. I do advise the 3rd cleanup/pass-through - you have to set it to the A slot anyway for the next piece. Make sure to clamp down tight. keep an eye out on the line, if you see it creep, the board slipped. Quickly put it back and live with the error. I never liked stop collars, so I enjoy the blockage of the unnecessary sixth holes. going though 100 joints I don't think I would remember to skip that 200 times. 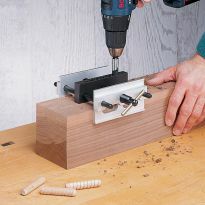 Provides a good joint connection using only a drill and clamp. Very simple to use. Pros: reasonable price, uses basic tools, easy process, good strong joint, would recommend. Bought this about a year ago and though haven't used it a whole lot but from what I can tell the joints it produces are quite strong. Stronger than a traditional mortise and tenon? Not sure, I haven't done any tests. But certainly strong enough for normal service. 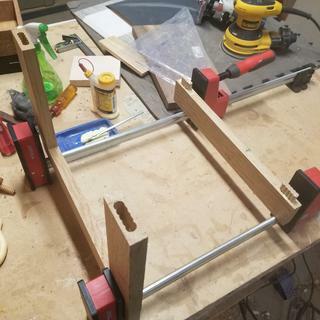 I don't have any sort of slot mortising jig but I feel like this is a bit slow in operation compared to something that would use a plunge router, or a dedicated mortising machine. The project I bought this for only needed 16 mortises for 8 joints, now I have something that requires 32 mortises and I'm wishing I had a slot mortising jig. Still, I'm using this because building a versatile jig that won't have to be redone at some point would require time that I currently don't have to spare. The tenon stock is a little pricey too, which is one of the reasons I wouldn't recommend cutting them much longer than 2 inches. The other reason is that the joints are a bit more forgiving in terms of parts wanting to go together at an angle with shorter tenons, and should still be plenty strong. I quickly discovered that the alignment is a considerable problem. Luckily I was able to correct this by offsetting my lines on the parts that I hadn't yet bored out the mortises for when I first used it. But I came up with a much better way of aligning it than the instructions would have you do. 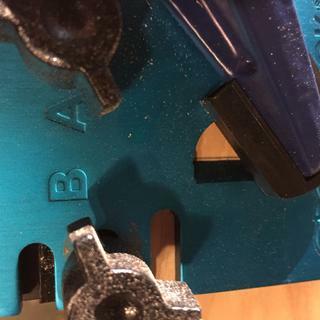 Just scratch a line dead center down the outside face of the steel drill guide block with a box cutter and mark the center line of your mortises on the face that will actually have the mortise, not the adjacent face. See the attached photo. Also, do yourself a favor and get a long reach vise grip for clamping the jig to your work piece (also visible in attached photo), it really speeds things up. I was getting errors of about 1/16" before I started aligning using this method. Great little kit for starting off on loose tenon joinery, a lot of holes to drill, but makes a good strong joint. The kit with a table top drilled for 1/2" tenons. To date, I have avoided mortise and tenon joinery as much as possible. This system is a really great alternative. The learning curve is pretty short and the final product works well. The only negative I found was that if you want to use this particular product for joinery in wood greater than 1" thick, you need to do "handstands". Yes it is possible, but tricky. I understand that the Pro package will handle this so maybe if I wasn't so frugal I'd have less to complain about. holes have a lot more cleanup needed than I expected. Am wondering if a brad point bit would work better. Setback depth accuracy was dead on for all 40 joints. The jig is well constructed with metal parts and should last a long time. I won't use it on every project, but for the price it is a keeper. The small locking knobs are hard on the hands! The lateral adjustment system is not the greatest. There is enough play in the jig that to get the alignment window perpendicular to the drill collars I had to visually line things up and then lock one of the knobs. Doable but a bit of a pain. The joints are a little inconsistent; one will be very tight and the next one loose - not unusable but looser than I like. Couldn't figure out why the variance. The mortises were difficult to cut clean - even following their suggestions about double drilling the A position. It is possible that is a result of the Pecan/Hickory which is very fibrous. Perhaps they would be cleaner with different wood? While the concept is ingenious, the drill bit leaves a scalloped mortise - which is great if everything is perfectly lined up but provides VERY little leeway if you need to shift the workpiece from side to side at all. The tenon stock is not cheap. My 40 joints will rack up $30 in tenon stock. I asked the sales manager if it was feasible to make my own (with the beadlock router bit) and his response was "I wouldn't even try it". Conclusion: The salesman at Rockler had no idea how to use the jig so I told him I would give it a try but that I would return it if I didn't like it. Frankly, it exceeded my expectations and, while not perfect, will find a permanent home on my workbench. 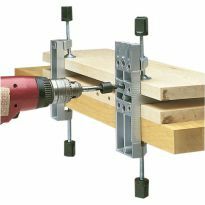 The drilling jig is easy to use, just clamp it all tightly. The tenon material is of good quality, but if you will do a lot of work, you might want to buy the router bit and make your own. First, this is not a precision instrument. And you're not paying for precision. So don't expect lots of bells and whistles. This is a basic jig. The guide edge to line up your register is not perfectly plumb. And for some odd reason, like another reviewer pointed out, it works better drilling from a horizontal plane rather than a vertical plane. I don't understand why, but vertical drilling does not produce evenly spaced holes that line up with the loose tenon. Horizontal drilling produces the hole spacing necessary for the loose tenon. I also found it very annoying I couldn't use my bit stops on this jig, but again...it's not precision and a piece of duct tape worked fine as the stop marker. I'm an experiened woodworker and I needed a learning curve to get the best result. Once I had my "schooling" on scrap, and got the hang of how to place the off plumb register marking, I was fine with the product. If you want precision mortise and tenons, do them the old fashioned way. If you can tolerate a tiny bit of slop, this is the jig for you. I made a bench for the end of our bed, and this was a fast and easy way to create the joints. Once assembled, you'd never know I didn't chisel the joints out by hand. Very easy to use, works as advertised. Wanted to give it a try and see how good it works. Good start to see if we like this method with the add on accessory gives us two sizes. After looking at other joining methods this system seem the easiest. The Beadlock Joinery system looked like a very convenient and almost equally strong alternative to using conventional mortice and tenon joinery. It certainly appears to be quite easy to implement. Looks easier than dowel and stronger than pocket screws. Borrowed this from a friend and found it easy to use and it produced a great joint. Much easier than the several other options I have used. I like the simplicty and sturdiness. Awesome tool. A great easy and inexpensive way to make a corner joint that is strong and square. Looks like an easier process for mortise and tenon joinery. This looks as if it would make it a lot easier to create quality joints. this looks like a simple system for making good strong tenon joints. If the basic system works as I hope, I will spring for the Pro Kit and the router bit to make my own stock, a $206.00 investment! I'd like to try this type of joiner. Seems easier than other methods. I do not have one so I thought I would try it. Looks like a great product can't wait to try it. As rarely as I would need to do loose tenon joinery, this should meet my needs very well. Making a dresser with some loose tenon joinery. Looks like it makes things a lot easier. It was new, and highly recommended. Worked great. 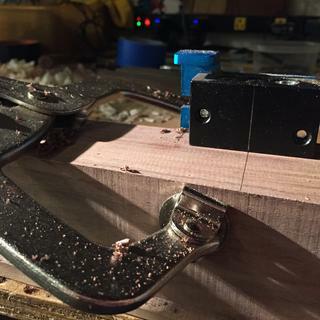 How do you make a beadlock mortise on the face of a wide board? For example you wish to cut a mortise 2 inches in on a 10 inch board. Has anyone cut the tab off that prevents you from using drill bit collars? issues? 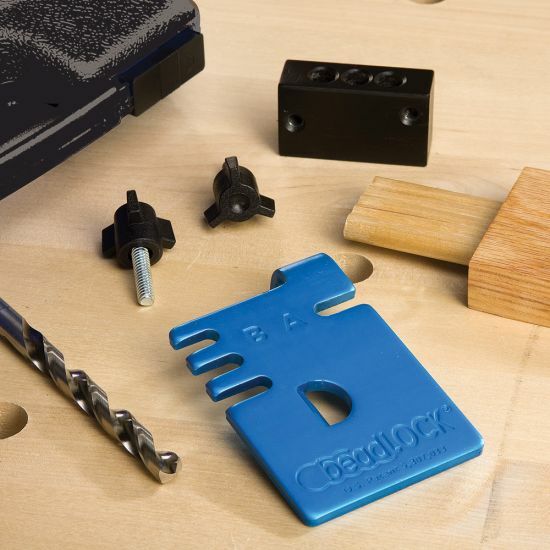 each), Or I'm I stuck buying the Rockler Beadlock® Pro Joinery Kit ($149.99 each) to make 1/2" mortises? I'm joining some 2x6 cedar for deck railing caps and making mitered joints, but I don't want to blow my deck project budget any more than I already have. Any and all comments and suggestions would be appreciated at this point. BEST ANSWER: I bought the Rockler 3/8" Beadlock Basic Starter Kit Item # 34802 ($29.99 each) and the Beadlock 1/2" Accessory Kit Item # 34985 ($27.99 each). They worked great together and the accessory kit pieces store in the starter kit's box. Does it come in a case like it is shows in the video? BEST ANSWER: Mine did come in a case as shown in the video. Case has space for both of the other sizes. Yes the black plastic case holds one size of this jig. The parts snap tightly into place. The jig is easy to use and the tenons provide more strength than wooden biscuits. What about through mortises how's it look after? BEST ANSWER: You could do through tenons, but I don't think it would look good. The tenon material has a ribbed shape. Can this be set up on a mitred joint? BEST ANSWER: Yes, provided there is sufficient width of stock to receive the tenon. 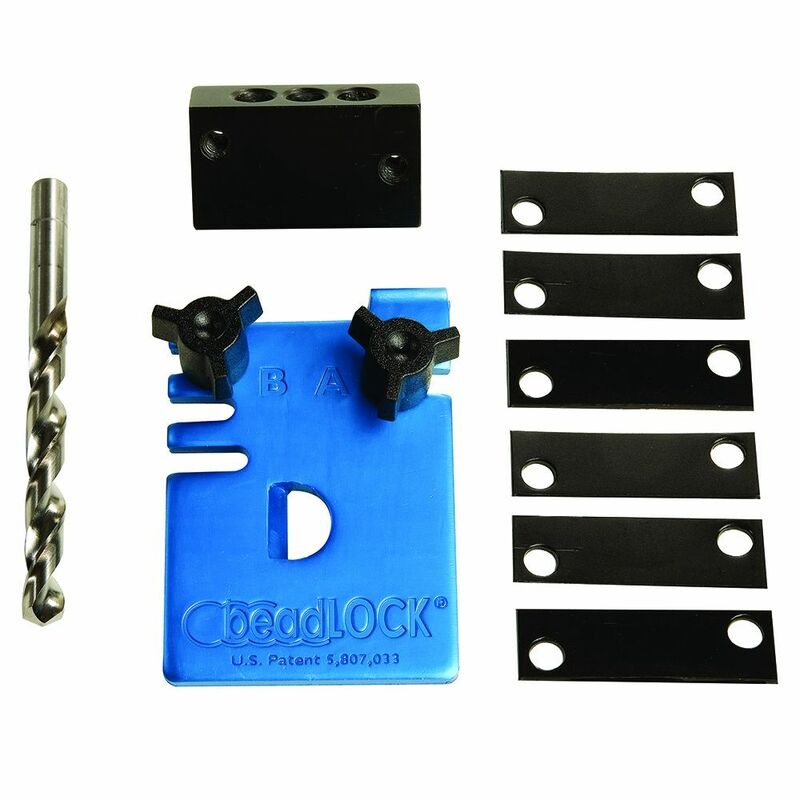 Can you use the 1/2 inch and 1/4 inch beadlock accessories with the 3/8 inch basic kit? BEST ANSWER: Yes, 38088 & 34985 ARE designed to work with this Basic Jig (34802); there is space in the case to store them as well and their bits. i'm making interior closet doors from 5/4 " x 3" wide clear ponderosa pine . for 36" wide doors . 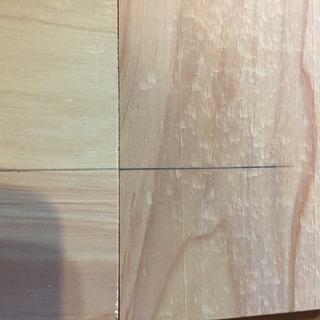 ideally ,what length should my tenons extend into each mortise , looking to confirm that the 3/8" thick tenons are adequate .or suggest otherwise ? the doors will have rather light weight panels also . any carpenters here built interior doors using the 3/8" beadlock system ? i've got 30 years experience. thank you . BEST ANSWER: Beadlock system is terrific. Strong and fast. Tenons should be at least an inch long.